We’ve all watched the zombie movies, we know how the world is going to end, but how will we fight off the swarms of man attacking zombies? Are you prepared and do you have the right gadgets to cut off their heads or de-brain them, which every zombie movie ever made has shown is the only way to kill the un-dead. If you watch a movie like Shaun of the Dead or the new TV series The Walking Dead, then you have a good idea of what you have to do to stay alive when a Zombie Apocalypse hits your area. There are a few great gadgets that you can get which will help you fight off the zombies, shoot them in the head, cut their heads off or de-brain them, depending how close you want to get. First is the Slingshot of Mass Destruction, which gets a full 10/10 on the scoreboard. This amazing slingshot shoots six 20mm balls at the same time. This means when you’re trying to run away from a load of zombies, you don’t have to stop to get precise aim, just shoot off a couple of rounds and some are bound to hit the zombies heads, killing them once and for all. If you can’t get your hands on the top two zombie gadgets, then the DIY Pulse Laser is your next option, this laser burns through plastic and thin metal, so you can imagine what it will do to a zombie brain and it gets a good 9/10. The next great gadget is the Navy Railgun which can be used from six miles away destroying its target. This means you can hide out and kill the zombies before they get too close, keeping everyone safe. This gets a good 9/10 as well. 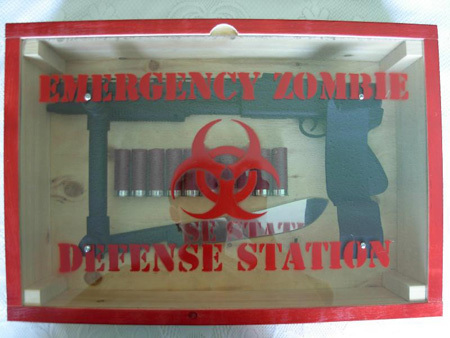 The Emergency Zombie Kit is compact and easy to store and pull out quickly when the zombies attack. The kit contains a shotgun with shells, a knife to kill the zombies up close and the kit doubles as a hard shield, just in case the zombies got to you without you realising it. This kit gets a 9/10 for convenience and ease of use. An Assault Rifle with a Chainsaw bayonet built in is specifically designed for zombies. It is an 8/10 when it comes to surviving the zombie apocalypse. Last is the Zombie Survival Kit in a Bottle which comes in at 3/10 ten and includes a six inch spike, ear plugs, cleaning kit, bandages, chocolate bar and you can even use the bottle as a weapon if you have to.